Carbohydrates are one of the major classes of biological molecules. Of course, they play an important role in energy storage and transport. They are also crucial parts of important structures such as DNA. Carbohydrates, in general, are polyhydroxylated aldehydes and ketones. That means their structure can be thought of as having a carbonyl, C=O, for one of its carbons. All of the other carbons in the structure are attached to a hydroxyl group, OH. It's a little more complicated than that because carbohydrates are sort of shape-shifting molecules: they undergo very simple reactions that can slightly change their structure, and they can change back again. The simplest carbohydrate is glyceraldehyde. It is a three-carbon chain with a carbonyl on one end and hydroxy groups on the other two atoms. The second carbon in the chain is chiral. Figure SC8.1. D-glyceraldehye is one of two enantiomers of the simplest carbohydrate. Figure SC8.2. Ball-and-stick model of D-glyceraldehyde. Go to Animation SC8.1. 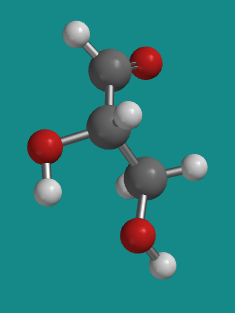 A three-dimensional model of D-glyceraldehyde. Figure SC8.1. L-glyceraldehye is the other of two enantiomers of the simplest carbohydrate. Figure SC8.3. Ball-and-stick model of L-glyceraldehyde. Go to Animation SC8.2. 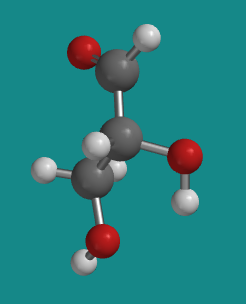 A three-dimensional model of L-glyceraldehyde. Biological molecules are frequently homochiral. That means that we have one enantiomer of glyceraldehyde in most organisms, but not the other. The one we have is D-glyceraldehyde. There are always a few organisms that have figured out over the eons how to make the other enantiomer of a naturally-occuring chiral molecule, but almost everything in nature shares our preference for D-glyceraldehyde. Not only that, but all of the other carbohydrates share that same chiral center. You can think of the other carbohydrates as being based on glyceraldehyde. To make a bigger carbohydrate, additional carbons must be added into the glyceraldehyde chain. They are added to the carbonyl end, leaving the chiral center of glyceraldehyde unchanged. Just as the second-last carbon (really, the middle carbon) in glyceraldehyde is chiral and has a specific configuration, so do all of the others, and they all have the same configuration at that carbon. Most of the time, if you look in a biology or biochemistry textbook, you will see carbohydrates drawn in very particular ways. Now, carbohydrates can always take a couple of different forms (remember, they are shape-shifters). They usually have a ring form and a chain form, although very small carbohydrates only have a chain form. The chain form is usually drawn in a cross shape or tree shape, with a long vertical line crossed by horizontal lines. These drawings are called Fischer projections. If there is a chiral center in a Fischer projection, then it matters whether groups on the horizontal line are drawn on the right or on the left. Figure SC8.4. Fischer projections of glyceraldehyde. The big advantage of Fischer projections is that you can easily tell at a glance the relationship between two molecules, and the relationship between specific chiral centers along the chain. Are the molecule the same? Are they mirror images? Are the chiral centers the same? Are they opposite? On the next page, we will see some slightly bigger carbohydrates. Problem SC8.2. Draw the following molecules as Fischer projections. Problem SC8.3. Convert the following Fischer projections into wedge-dash drawings.